An elected member of the Julian fire board says he learned about the new fire chief Monday “through the grapevine” and still hasn’t been formally notified. On a day when a Julian volunteer fire captain says he was “escorted” from the fire station (for verbally insulting the outgoing chief) and 24 hours after a popular battalion chief was put on leave — director Brian Kramer was sounding an alarm Wednesday. Kramer, a retired custom home builder and founder of the short-lived Julian Film Festival, was elected to the Julian-Cuyamaca Fire Protection District board in November 2016. On Wednesday, he was watching a drama he had a hard time explaining. 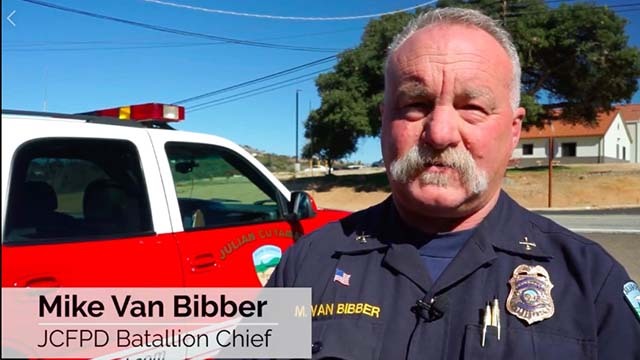 Popular Julian Battalion Chief Mike Van Bibber was placed on administrative leave Tuesday. Kramer said it’s the board’s responsibility to hire and fire the paid fire chief. Bell said Roesler would report to the district board. “The Fire Authority/Cal Fire personnel are contracted to work alongside Julian reserves and volunteers at no cost to the district or community,” she said. The current chief — Rick Marinelli — was spending his last day Wednesday avoiding questions. He wouldn’t respond to requests for comment on the incidents. At lunchtime Wednesday, Marinelli was being saluted at a retirement party at Wynola Pizza, west of Julian. Kramer said Cal Fire members and other Julian board members were present. He said Marinelli and Marcia “Missy” Spahr, the district’s paid secretary, were served deposition subpoenas at the pizza house. Shelver, 82, confirmed this, but said he didn’t see the service being made. Asked how many people were at the party, she said: “I’m not telling you anything” and hung up. Van Bibber, in a telephone interview from San Marcos (where he was renewing a commercial truck driving license at the DMV), said Marinelli told him about 11:30 Tuesday morning that he was being placed on administrative leave for issues involving a worker’s compensation claim he had with the Carlsbad Fire Department years ago. Shelver, the board president, said the board learned of the worker’s compensation claim only weeks ago and was advised by district lawyers to place Van Bibber on leave in case his injury proved to be a “liability” issue for the district. Van Bibber, 62, said he refused Marinelli’s order to turn in his firefighter gear. He said his attorney was preparing paperwork over the action. Wednesday morning, an angry volunteer fire captain — David Southcott — went to Marinelli’s office in the fire station to berate his retiring boss, saying he “had no integrity” and reportedly calling him names as well. On Thursday, Southcott said he was put on leave as a step toward his firing. Sheriff’s Lt. Greg Rylaarsdam said Southcott was neither arrested nor detained. Rylaarsdam said the Julian sheriff’s station has been asked to provide security for an announced protest at 8 a.m. Friday at the Fire Station, 3407 Highway 79. He said he was calling in extra units that day, a “purely precautionary” move.